Have you a itinerary for Rome we are going for 6 days, have one day out of Rome and half a day with the six nations. Therefore, let me give you some highlights, that we can fine tune based on what you like the most. Let me tell you that I personally love to walk in Rome, browsing the old streets and squares. 5 days (+ one outside the town) will give you plenty of time to enjoy the town and its laid back atmosphere. I’m organizing it by day (the order is not important, but some days are better than others for some sites, and museums are usually closed on Sunday), each one dedicated to a specific neighborhood./ attractions. For your convenience, I’ll refer to some of my posts for a quick description of the sites. 1) St Peters + climbing up the dome (http://delightfullyitaly.com/2013/10/12/climbing-up-st-peters-basilicas-dome/) + Vatican museums. Consider a full day for all this sites. You can’t visit St Peter during Sunday morning (there’s the pope! ); better to reserve you Vatican museum tickets, to avoid spending hours in queues (http://biglietteriamusei.vatican.va/musei/tickets/do?weblang=en&do).. At night have a drink and a Pizza in Campo de’ Fiori square. 2) Walking tour: the Imperial Rome. From Piazza Venezia, visit the Campidoglio square, designed by Michelangelo who “recycled” the roman temple of Jupiter. Visit Santa maria in Aracoeli, then take the elevator for a wonderful view on Rome. Go to Via dei Fori Imperiali (passing close to the Carcere Mamertino, St Peter’s jail, then enter the archaeological area of Fori Imperiali (ticket -needed it includes also the colosseum) and visit the Forum and the Orti Farnesiani (renaissance garden build in the XVI century over the remains of the Emperors palaces). Visit the colosseum and, if you have the time, have a nice walk in the medieval rome to discover the Roman houses buried under medieval churches (http://delightfullyitaly.com/2013/05/06/medieval-rome/). At night, have a walk in trastevere and find a restaurant there. 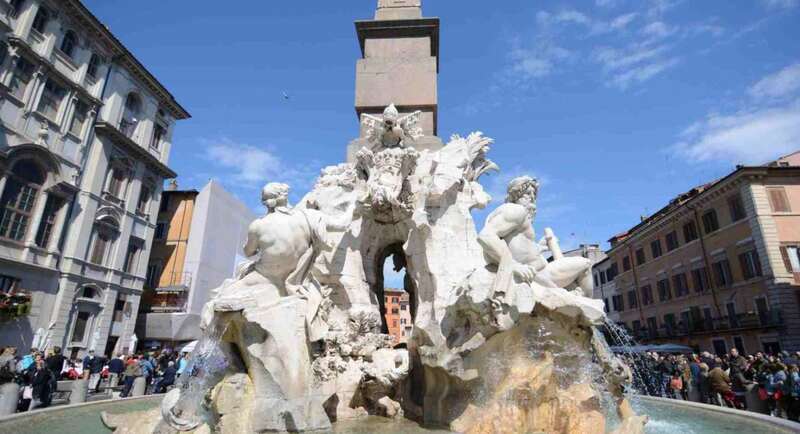 3) Walking tour: the Jewish Ghetto, Trastevere and palatino: start in Campo de Fiori (nice market on week days) and walk to Largo Argentina. There you can enter the old Jewish ghetto (http://delightfullyitaly.com/2013/05/17/rome-fountain/) and discover this out of the beaten track part f Rome. Have also a look at Portico di Ottavia and at Teatro di Marcello. Cross the Tiber river at Isola Tiberina, (that you can Visit) and enter into Trastevere, heading toward Santa Maria in Trastevere Church. Visit the middle age cghurch and enjoy the “old village” atmosphere. Loose yourself in the old streets, if you want you could visit Villa Farnesina Museum (paintings from Raffaello) and the Santa Cecilia church, hosting a touching statue of the saint. From there cross the Tiber and visit the Santa maria in Cosmedin medieval church, which hosts the Bocca della Verità. From there you can get to the lovely Palatino Neighbourhood, where you should visit the Giardino degli Aranci, the Santa Sabina church and the famous Key Hole with a view over St Peter (Piazza Cavalieri di Malta) At night, go back to the ghetto for a kosher dinner. If you are there during summer time, don’t miss the “estate Romana” stands and restaurants on the Isola Tiberina and Tiber banks. 6)Day out of Rome. Two suggestions. Visit Ostia Antica, very similar to Pompei, but less than on ehour underground from Rome center, or go to Tioli an dvisit Villa D’Este and its magical fountains and Villa Adriana (Emperor Adriano’s majestic villa).